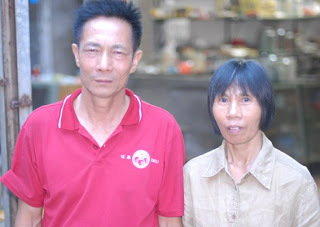 Guan and Xiao have run their grocery in a backstreet of the village for 25 years now. They live in the rooms behind the shop, but used to live in a house in a neighbouring village until that village was one of the many demolished in 2004 to make way for the construction of eight new university campuses known as Guangzhou’s ‘University City’. Completed within 8 months, University City brought an influx of jobs and money to NanTing. Many new shops and restaurants opened on the outer edges of the village to cater for the huge new student population. Not many students take a walk down Guan and Xiao’s street though, so commerce there has stagnated. Now, the scales are rusty and the shelves are relatively bare; packets of noodles, cigarettes, alcohol, soft drinks, household products are sold to their friends and neighbours. The odd bottle of quality spirits gathers dust. Xiao says before University City, they opened all day every day and had a busy pool hall on the 1st floor. Now she opens up 8am to midday and 5pm to 11pm. Afternoons are spent weeding a local farmer’s fields because she can earn more money that way. Similarly, Guan delivers gas cylinders throughout the village. They host card games most evenings in front of their shop. Xiao told us they no longer pay for a license to trade and nobody cares to ask, so they carry on regardless. Despite the new prosperity in the village, many locals, like Guan and Xiao, resent the fact they lost their homes without adequate compensation. There is still a refugee camp close by that continues the protest and attempts to prevent the planned destruction of a temple. A friend of ours says that NanTing is threatened too, with plans to build a huge shopping centre on the land.